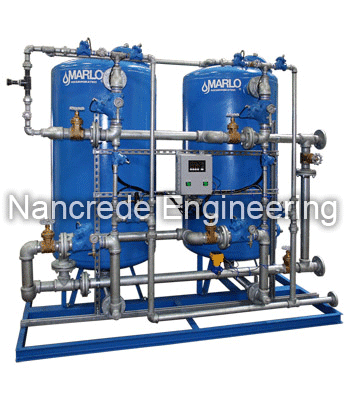 Designed for larger industrial water softener applications. Individual tank capacity ranges from 150,000 grain to 1,050,000 grain with continuous flow rates of 20-190 GPM. Tank diameters up to 42″ and service pipe connections up to 3″ NPT are available. Single tank, multi-tank parallel, twin alternating, and triple alternating systems are available with a wide variety of timer and water meter controllers. Epoxy lined and prime exterior finished industrial softener grade carbon steel pressure vessels. Non-ASME construction with 100 psig working pressure. Galvanized steel face-piping assembly with cast iron, normally-open, “Y” pattern diaphragm control valves. Pilot stager valve controller for automatic regeneration operation. Pre-wired in a NEMA-12 enclosure with an adjustable timeclock for regeneration initiation. PVC pressure-compensated brine injector for correct brine flow and concentration. “Safety Blue” finish painted vessel exteriors. Mechanical automatic-reset water meters for volume initiated regeneration. ‘MX’ Electronic programmable cycle controllers for systems up to 3 softener tanks. Flexible system control for almost any configuration using timer or volume initiated regeneration. “Additive Flow Feature” for automatically bringing additional tanks on-line as service flow increases. Sch 80 PVC face-piping and thermo-plastic diaphragm valves. High temperature constructed and condensate polisher designs. ‘SRS’ Salt Recycler System for 25% less salt consumption without loss in treated water quality. 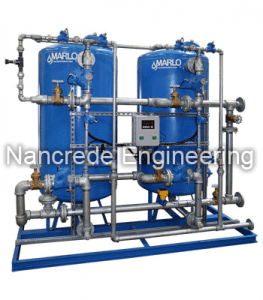 Requires additional control valves, enhanced stager controller, and modified brine tank.